12 Bar Blues is a universal set of chord progressions using the I, IV and V Chords. 2 measures of C Chord. This equals 12 measures. If you know the 7 chords you can use the C7 chord, G7 and F7 in place of the 3 note chords. Now you know the pattern, you can play with any musician around the world. What’s fun about playing the 12 bar blues is that it is simple enough where everyone can start learning to play rhythms, and begin improvisation. I am going to give you some ideas of how to play the blues. This will be very simple to learn and is excellent for playing hands together if you are a new piano student, it will strengthen your hands and fingers, and start you playing rhythm. OK, here we go. Starting with the left hand, let’s learn a boogie woogie. The left hand will be played in quarter notes, in 4/4 time. beat 4, play C and A together. beat 4, play G and E together. beat 4, play F and D together. Next apply the left hand to the 12 bar blues, playing the correct chord in each measure. Practice and memorize the left hand boogie following the formula for the 12 bar blues. What will the right hand play? The right hand can play the 3 notes chord. C chord = C-E=G, F chord = F-A-C, G chord = G-B-D. 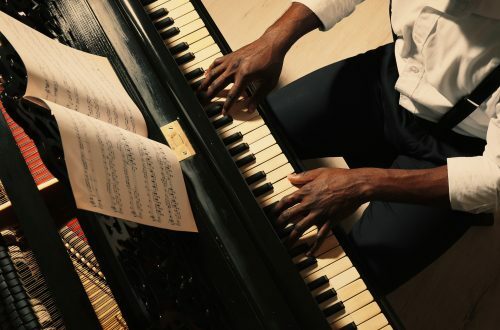 I would suggest when you first add the right hand to the boogie, play the right hand chord only on the 1 beat, until you can play hands together easy. After practicing the simple hands together, try to play the right hand chords in any rhythm that sounds good to you. For example, you could play a right hand chord on the 1 beat, and play eighth notes of the 4 beat. Now you have a rhythm. Once you start a rhythm, continue the same pattern throughout the 12 bars. Alana LaGrange is the founder of Music and You An online piano lesson website teaching beginning, Intermediate, music arranging and jazz. She has published piano lesson books, and is also an arranger and recording artist.